The beep of the machines in the hospital room, which are monitoring the vital signs of, not only my wife, but our soon to be newborn daughter, have faded into the background and are replaced in the foreground by the three March Madness games I have playing in the room: one on the hospital TV which is fuzzy, one on my iPad, and one on my laptop. The games are playing, not only because we’re fans of college basketball, but because they are a necessary distraction, as we have been in this room since 9 in the morning simply waiting. This was not how we had typically spent St. Patrick’s Day in the past. Although I was praying for the luck of the Irish to bring my daughter into this world on St. Patrick’s Day, she did not enter this world until 8:15 am the next day. My wife and I couldn’t have been more elated to have a happy and healthy baby. However, my visions of green quickly faded to pink and the chapter of my life which begins with fatherhood and the responsibility of a child’s life had begun. At the time, I did not realize the enormity of what this would entail. To be honest, I don’t think anyone really does. We understand the concepts that surround the responsibilities parenthood entails, but until we actually go nights without sleeping, attempting to soothe a crying baby, washing bottles, multiple feedings, changing diapers, and trying to fit in trips to the grocery store around naps and feeding schedules, we don’t really understand. Happy and holding my daughter in the hospital a day after she was born. I know what you’re thinking: good opening, but how does this all relate to bourbon? Well, for me, bourbon had always been a part of my life since college. I always joke with people that having graduated from the University of Kentucky, we may have different majors, but we all graduated with minors in horse racing, basketball, and bourbon. Bourbon has been a center of much of my social life for many years. It represented trips to the bars and fun nights with my friends, it was what I had smuggled into Rupp Arena the first time I walked up the steps and saw the big blue UK across the hardwood floor, and it represented sipping a good drink after a long day at work when you got that satisfying feeling of a job well done. How was that going to fit into my life now? For a couple of years before my daughter was born, my friends and I had really been into having “Bourbon Nights”. We would each bring a bottle of bourbon and do a blind tasting of 4-5 bourbons and rank them. We were expanding our palettes, trying new things, and really finding out some interesting things about our preferences at the same time. I really suggest this by the way, sometimes we can be blinded by brand names and marketing. The blind tasting really removed all of that and allowed us to really get at what we exactly liked. We were exploring if we liked wheaters opposed to high-rye, barrel-proof to lower-proof, what ages we liked best, and all sorts of things in between. Certainly, we would be too loud to continue these nights at my house with a newborn. Even if my one of my friends was hosting, when would I be able to get away from the responsibility of a newborn to go enjoy one of these nights? Would it even matter if my friend was hosting because there was no way I was getting even close to buzzed knowing that once I got home I could be called to a crying baby at a moment’s notice? It was when all those things were running through my head, that a funny idea popped in my head, and an amazing discovery that would change my life in fatherhood forever would happen. 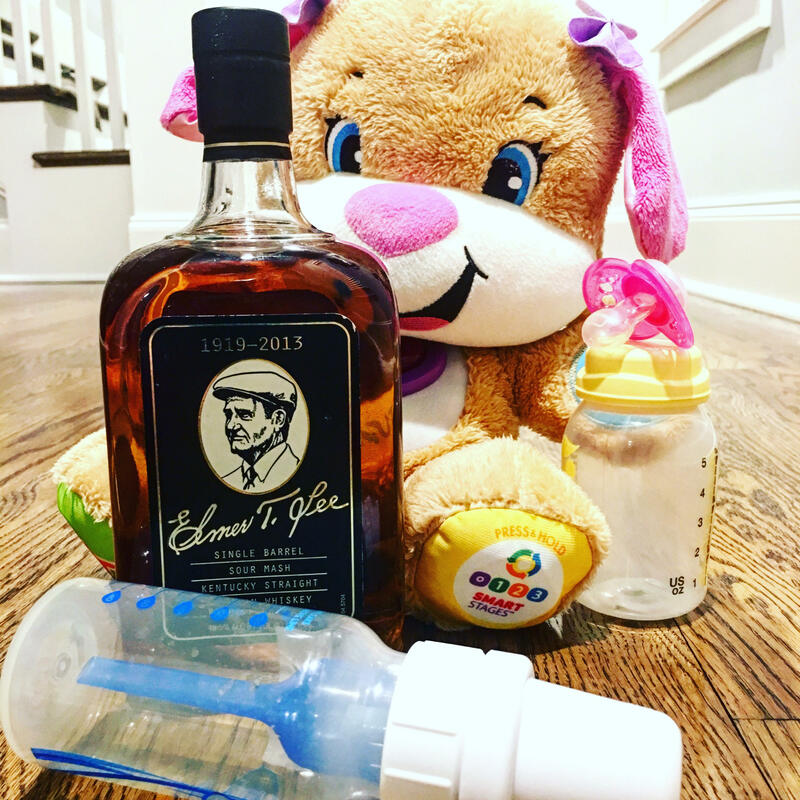 On a whim, I had decided to create an Instagram account dedicated to bourbon merged with this idea of fatherhood. So, I thought and tried to come up with the cleverest name I could: @subourbon_dad. Initially, the account was created purely to amuse myself. I would take a picture of some bourbon earlier in the night, and after I read my daughter a story and was rocking her to sleep, I would edit the picture, write a description, and post it. I figured that I had vast enough collection of bourbon that I had acquired over the years that I could entertain myself this way for a while, while still cautiously enjoying something I loved. A funny thing happened after that, people started responding. Now, I know I don’t have an awe-inspiring amount of followers, and there are plenty of accounts that have more followers and are more reputable than mine was, but just the simple responses were amazing. I found myself able to enjoy all the things I had loved so much about bourbon from the comfort of a glider chair in my daughter’s nursery. Instagram brought me back the bourbon experiences, community, and interesting discussions, that I had shared so many times with my friends on our “Bourbon Nights”. I had found a new community of some of the nicest individuals ever who are happy to share samples, send you tips when they may have spotted a hard-to-find bottle, or just make you laugh. I stumbled upon websites, and podcasts, and other Instagram sites dedicated to others’ experiences with bourbon as well. It inspired me, as the long days of caring for a newborn weened to sleeping through the night and some free time, while always watching a monitor, to create www.dadsdrinkingbourbon.com to discuss my bourbon and whiskey experiences in greater detail with a friend who also had recently become a new dad. The thought behind this site is that anyone, whether they are a dad or not, can submit a review or an article. These reviews would be simple, because dads are busy. Many reviews can focus on tasting notes and a numerical rating that can be confusing. Not to dismiss this rating system, but many just want to know whether or not they should spend their hard-earned money on an expensive bottle. I’m thankful for my wife. She puts up with me discussing bourbon, writing about bourbon, thinking about bourbon, and has to look at the collection of bourbon which has overrun her dining room. This same dining room where one day, when our daughter is older, we hope to have many memories of sitting around the table as a family. Her acceptance of my hobby allows me to continue to pursue my passion. She is an amazing person to bounce ideas off of, and she’s also the best mother I have ever met. Our daughter is lucky to have her as a mother. She certainly is a wild one! So, as I am getting somewhat wordy, the moral of the story is that the birth of my daughter was an amazing event in my life. She is the greatest gift I’ve ever received and the most important thing I will ever do in my life. She is my number one priority in this world. However, that did not have to mean that the enjoyment in the passions in my life prior to that amazing day in March did not have to end the day she was born. Thank you to the bourbon Instagram community for all that you do and all that you have given me. Although different than before, you have given me an outlet and a way to experience bourbon in a way that I had not imagined previously. I am forever grateful.